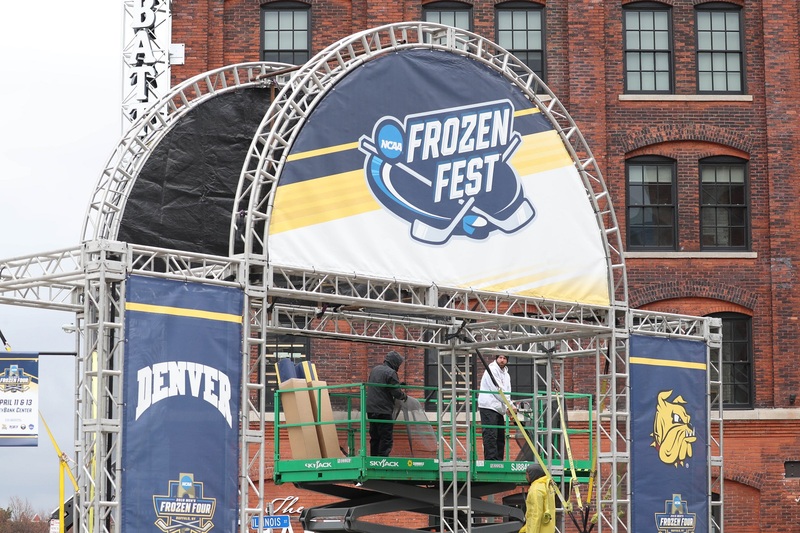 The Men's Frozen Four NCAA hockey championship is skating into town just as businesses begin to thaw from winter's typically slow first-quarter. The event, which culminates with the championship game Saturday, should be good news for the city's hotels, bars, restaurants and entertainment venues, resulting in as much as a $3.9 million economic boost, according to estimates from tourism board Visit Buffalo Niagara. Though ticket sales for the event came up about 4,000 short of a sellout as of Tuesday, local businesses say the event will be welcome nonetheless. The hockey tournament doesn't have the same entertainment draw nationally as other big sports finals, such as the NCAA Division I men's basketball tournament, which last came here in 2017. But the Frozen Four is still expected to draw thousands of hockey fans to Buffalo to eat, drink and celebrate their teams. SoHo on West Chippewa is hoping for a big bump but has added just "a little" extra staff to prepare for it, said manager Ben Rydzik. He expects locals and out-of-towners alike to stop by, along with plenty of Canadians crossing the border to be close to the action. "People are excited to get out of work early and watch the games," he said. "Buffalo is a hockey town." SoHo hosted the Providence Friars for dinner Wednesday night while its sister restaurant, Frankie Primo's, hosted them for lunch. Jason Ryals, general manager at the Anchor Bar, said he has had the event on the restaurant's calendar since it was announced for Buffalo. And even though it's not a sports bar, Anchor Bar can always count on tourist traffic from the traveling teams and fans, he said. "We're a destination in Buffalo," he said. "This is a stop they have to make." (716) Food and Sport is in the middle of the action in HarborCenter. It has reservations and large parties booked Thursday and will add some staff to take care of them all. "It looks like we're gonna be pretty busy that night, oh, yeah," said Raine Oakley, an employee there. University of Minnesota-Duluth Bulldogs alumni have booked a pre-game gathering at Pearl Street Grill & Brewery. Dodi Letina, head bartender at Washington Square Bar & Grill on Washington Street, doesn't expect March Madness-level crowds, but she believes she will have a packed house. She notes that there are "an awful lot more bars downtown" to compete with than there were when the hockey championship was here in 2003, but she's still prepared for a bustling crowd with added staff, and extra roast beef and wings. "The beer cooler is full," she said. The Doubletree Hotel by Hilton in Amherst will host the University of Massachusetts Minutemen when they get into town Thursday night. The players, staff, coaches and family will rent 75 rooms until at least Friday morning. If they win their semifinal game Thursday, they'll stay for Saturday's national championship game and then check out Sunday. "That's a great piece of business for my hotel," said Olivia Galante, director of sales at the Doubletree Hotel by Hilton in Amherst. "This does not happen often for our property. It will make our month, money-wise." Though the hotel has plenty of rooms, it has less meeting space than most other hotels, which prevents it from booking as many large corporate groups as its competitors. Sports teams, such as the Girls National USA Hockey team it recently hosted, are a welcome windfall. It's not just the rooms. The players and their entourages plan extras with the hotel's banquet staff: breakfast, pre-game meals, dinners. And fans can be counted on to eat and drink in the hotel's bar and restaurant. As of midday Wednesday, many hotels downtown were sold out, including the J.W. Marriott at HarborCenter, the Hampton Inn and the Courtyard Marriott. Hilton properties, including the Hampton Inn and Homewood Suites, were booked up as far out as Hamburg, East Aurora, Lockport and Niagara Falls. There are other vacancies, few rooms are left. Prices are high, too. The Adam's Mark, which is advertised for $90 the following Thursday, is going for $258 Thursday. The Westin, usually $175, is running $371. And the Fairfield Inn & Suites at the Buffalo Airport, regularly $101, is booking at a whopping $548. The only other time Buffalo hosted the games was in 2003, when tickets sold out a year in advance. Hotels have had contracts to host teams signed for two years. Tickets for the three games haven't sold out yet, but as many as 14,000 people are expected to attend each session Thursday and Saturday. Many of those attendees are from out of town and will need Ubers, hotels and places to eat. Fans are expected to account for 5,300 hotel room nights in downtown Buffalo and generate about $3.9 million in economic impact, according to Visit Buffalo Niagara. That dollar amount factors in transportation, lodging, food, beverage and entertainment costs based on an estimate of teams, NCAA officials and staff, media and fans that are expected to attend. The organizing committee that helped bring the games shared a higher $6.1 million estimate that factored in more fan data for ticket sales and hotel bookings. Erie County Executive Mark C. Poloncarz, who made a pitch to host the Frozen Four with Mayor Byron Brown and representatives from Canisius College and Niagara University, said the competition was "stiff" to win the games, but he believes Buffalo has proven itself worthy. "As a community, I just hope that we do roll out the carpet. 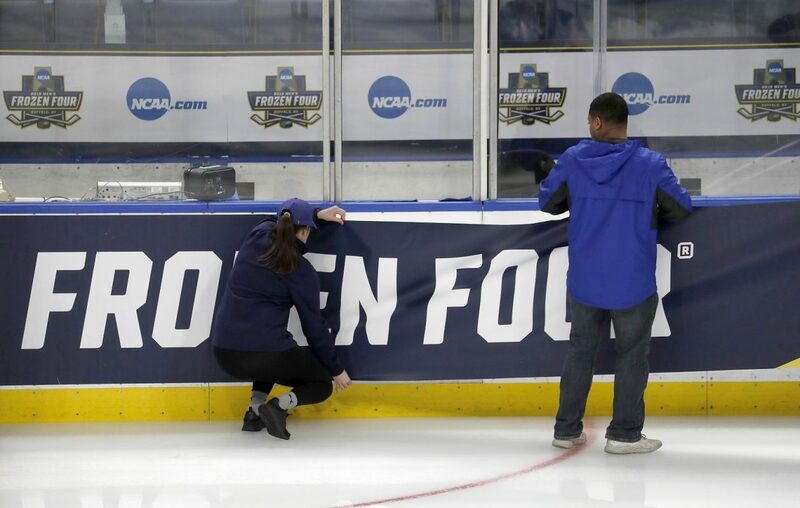 It really is one of the premiere events that the NCAA has, and it's very rare for a community like Buffalo to receive it twice in, basically, a 20-year period, " Poloncarz said. "It just goes to show that the NCAA believes in our community by bringing it back here," he said. Samantha Christmann – Samantha Christmann covers retail for The Buffalo News and writes the Discount Diva column.